These two countries are possibly the most popular with gap year travellers especially among us Brits. It may have something to do with the awesome working holiday visa we are offered and the high rates of pay but I think the activities on offer also have a lot to do with it. I don’t want to stereotype but gap year goers are normally after adventure whether that is skydiving 15,000ft kind of adrenaline or hiking over an ice glacier. Australia and New Zealand are rich in adventure activities and cater for mild to severe adventure seekers. Having visited both countries myself and experienced some amazing adventure activities I thought I would share the best with you. Driving on sand on Fraser Island – A tag along tour is the BEST way to see Fraser Island. On this trip you can have a chance at driving on the famous sand island, cheer as the other 4×4’s get stuck in the sand and see all the highlights there is on offer. The trip involves camping out with your new found friends for two nights, enjoying a bonfire and too much goon. Diving on the Great Barrier Reef – The Great Barrier Reef is one of the biggest draws to this country and spans along the north of the east coast. Starting as far south as the Whitsunday Islands you will see incredible coral and an abundance of fish. Dive trips run up and down the Great Barrier Reef but you’ll find the biggest pick in Cairns. 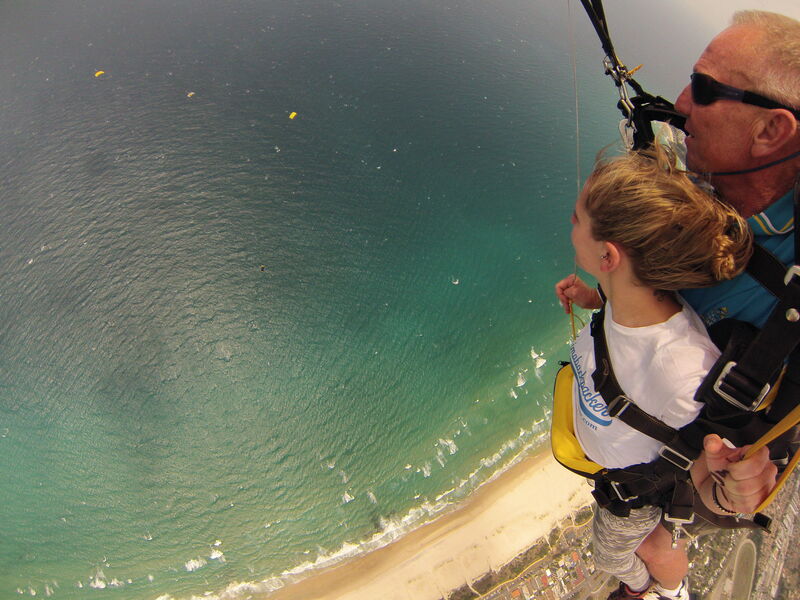 Skydiving on to the beach – Skydiving is available everywhere, New Zealand included and most companies will offer a variety of jump heights. In all honesty I don’t think there is much difference in 12,000ft to 15,000ft but there is a difference in your experience depending on the weather. Choose your location wisely and pray for good weather. Crocodile river cruise in the Daintree – The Daintree river and rainforest is the largest continuous area of tropical rainforest in Australia. It backs on to Cape Tribulation (where reef meets rainforest) and is a beautiful place. It is also highly infested with saltwater crocodiles and this ancient rainforest makes a perfect location for spotting them on a river tour. Learn to surf in Byron Bay – Possibly the most iconic activity in Australia in the most iconic area of Australia. Byron Bay really is everything it says on the tin and you can pretend to be that cool surfer dude/chick for a few hours… it comes at a hefty price tag though. Heli Hiking on an ice glacier in Franz Josef – Glacier hiking is an activity only available in a few countries but what makes Franz Josef even more special is how you access it….. Helicopter. There is no road to this glacier so every guest is transferred in a helicopter for the hike. The activity is weather dependant and you could wait for days, but trust me it’s worth the wait. Bungy Jumping in Queenstown – Possibly the most famous activity in the whole of Queenstown and there are a lot of adrenaline filled activities in this town. The Nevis Bungy (highest in New Zealand) is not for the faint hearted but will certainly provide the thrill for anyone looking. Queenstown is also famous for its Canyon Swing. 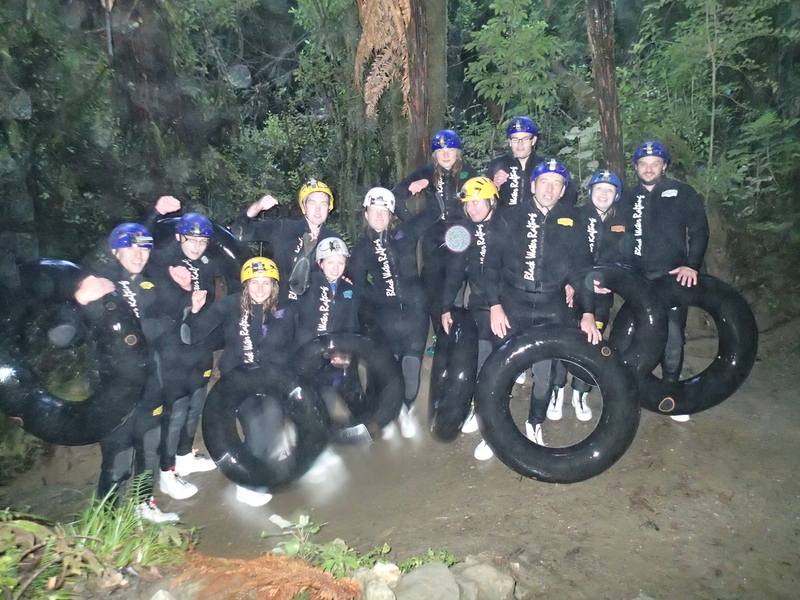 Black Water Rafting with glow-worms in Waitomo – Crawling through pitch black caves with a rubber ring and glow worms for company may not sound like your cup of tea to begin with but what an experience. This black water rafting activity is adventure at the max, jumping down water falls, abseiling and floating down steam while you stare at the glow worms. It is certainly very different to white water rafting and the top activity on the north island with Kiwi Experience. Hike 18km over mountains on the Tongariro Crossing – Voted in the top 10 one day walks in the world, I was surprised at how many of our Kiwi Experience group DIDN’T want to take part in this activity. Yes it’s a toughie and you need to be at least a little fit with no hangover for the big day but the views and experience certainly make up for missing out on one big night. If you are a LOTR fan this is a MUST. Swim with dolphins in Kaikoura – This is known among travellers as THE place to see dolphins and whales. They offer the full experience of swimming with these wonderful creatures or just watching from the deck of the boat. From what I’ve heard it won’t just be a handful of dolphins either but more like a pod of 100’s, can you believe it. If you are heading down under soon, I hope this helps you decide what activities to do. Hey – I read you went scuba diving in Cairns, I’m wondering what company you went with and if you’d recommend them? Thanks. Hi Sarah, as mentioned in the post I linked the scuba diving my boyfriend did was from the Whitsundays boat trip we took in Arlie Beach so unfortunately I can’t recommend one in Cairns.